Less than 35 minutes from Gettysburg right down Rt. 15! Landon House Mansion After purchasing the antebellum Landon House Mansion in 1999, Kevin Dolan realized he had a problem: How does one person maintain a 268-year-old 12,000-square-foot mansion and estate? He realized he would need to make other people care about the property as much as he did. Today, Dolan shares his passion for history under the guise of Johnny Reb, a character modeled after General J.E.B. Stuart. Audiences now crowd into the Landon House Mansion to watch him orchestrate the Sabers and Roses show, which pays homage to the legendary 1862 ball that took place before the Battle of Antietam, before embarking on a tour of the historic mansion and estate. Originally built in Virginia in 1743 as a silk mill, the mansion played a pivotal role in the war as a base for both Confederate and Union soldiers. Every event aims to educate guests about the history and significance of the estate’s role in the war. The proceeds of Dolan’s creative ventures go toward keeping the historic landmark from falling into disrepair, and his role as the Haunted Landon tour guide landed him on an episode of A&E’s Psychic Kids. Dustin Pari of Ghost Hunters TV Show fame recently undertook a private investigation of this very haunted Confederate Mansion after hearing about it from his manager. COMING IN 2012...the long-awaited documentary SABERS AND ROSES written, directed and produced by Kevin Dolan, owner of the Landon House in Urbana, Maryland. This controversial documentary takes a hard look at the Civil War subculture that survives and thrives 150 years after the end of the Civil War. The central theme of this documentary ten years in the making is very timely...What would have happened if the South had not seceded? Where would we be today as a nation? What if the Confederates had "spun" their cause like Lincoln did? Coming in Spring, 2012! Follow Dolan in his guise as rocker "Johnny Reb" as he tries just about everything you can think of to save the historic Landon House Mansion & Estate...you name it...he's done it! Weddings, reenactments, Haunted Events, Paranormal Investigations, Farmers Markets, Civil War Reality Shows...promoting across the country for the past ten years in Nashville, Los Angeles, Michigan, Chicago, New York City, Austin, Houston, Dallas...premiering in 2012 on the 150th Anniversary of the Confederate Invasion of Maryland in 1862! with a Landon House Wedding! The historic Landon House in Urbana, Maryland (less than an hour from D.C., Baltimore, Gettysburg, Annapolis, Harpers Ferry and Leesburg) has just announced its one-stop Weekend Wedding pricing of just $80 per guest which includes usage of the 12,000 square-foot Landon House mansion and six-acre estate, tented deck, delicious 2-entree buffet-style meal with all sides, all tables and chairs; all lines, toppers and linen napkins, DJ, bartender and all setup, cleanup and coordination as well as taxes and service fees. Guests may provide their own alcohol. Landon House will continue to only book one wedding per day. Owner Kevin Dolan is excited to make the announcement: "We feel that there are a lot of brides and grooms who want to have a nice wedding at a great place but are on a tight budget and trying to save the down payment for a house. With our one-stop Weekend Wedding package that is exactly what they can do with a Landon House wedding. One thing we're not changing is our policy of only booking one wedding per day..." Pricing includes a two-hour setup, 1/2 hour wedding ceremony, 4-hour reception and one hour cleanup. minimum of 100 guests. 50% non-refundable deposit to secure date. Tent is extra. KNOW SOMEONE GETTING MARRIED? TELL THEM ABOUT THIS DEAL! The historic Landon House in Urbana, Maryland is available for your destination wedding. Our 12,000 square-foot historic CIvil War mansion on six idyllic acres is just 4 miles south of Frederick on Rt. 355. Site of legendary Confererate General J.E.B. Stuart's Sabers and Roses Ball held on September 8, 1862 before the Battle of Antietam. Convenient to Pennsylvania, Virginia, Maryland, DC and West Virginia. Travel distances of up to one hour are considered acceptable by most wedding guests according to hospitality industry sources. Pricing program is valid through August 31, 2010. 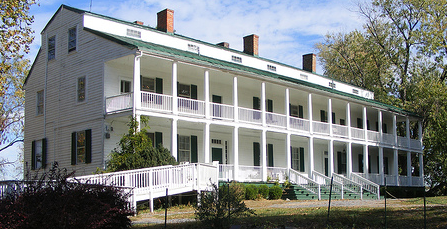 Wedding revenue is used to preserve the historic Landon House for future generations to enjoy.